It has been a few months since I greased up my bundt pan, but with the days turning colder I was ready to dig into a little cake, so here I am. 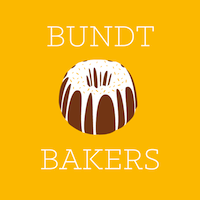 Inspired by this month's #BundtBakers challenge was to serve up our favorite hot chocolate in bundt cake form. Now, I have to admit that my favorite mug of cocoa would probably be peppermint with lots of extra marshmallows, but my November cake was inspired by a chart of Hot Chocolate Inspiration that this month's hostess, Stacy from Noshing with the Nolands, provided. It listed several fun twists on classic cocoa, but I was drawn to the idea of chocolate and lavender. Lavender? Yes, this was a new twist for me, but after a few eye-opening google searches I found that it was not unheard of. Much like coffee can deepen the flavors of chocolate, lavender brings out the floral notes that we often overlook. Of course, I just happened to have a big jar of lavender just begging to be put to good use. I have used some for other projects, but originally purchased it for scones. Why not see how it faired in some decadent chocolate cake? This recipe started by steeping my lavender in a cup of boiling water. This part made the whole kitchen smell divine. I hightly recommend it. Then I put my infusing in a dark cocoa bundt cake that is moist and amazing. Truly a winning combination! Start by steeping the lavender petals in boiling water while you prepare the rest of the cake. Butter or spray a 12-cup bundt pan, then dust with dark cocoa. Preheat oven to 350 degrees. In a stand mixer, cream together the butter and sugar. Add eggs, one at a time, scraping down the sides before each addition. In another bowl, sift together the dry ingredients, set aside. Whisk together the milk and sour cream. Add half to the mixer, then alternate with the dry ingredients. Mix to incorporate. Strain off the lavender blossoms and add the water to the mixing bowl. Just mix through. Pour into the prepared bundt pan and bake for 50- 60 minutes, or until a toothpick comes out clean. Let stand for 10 minutes before inverting. Let it cool completely, then wrap overnight before glazing. For the glaze, whisk together the milk, powdered sugar and food coloring. I made mine purple, but it could easily be omitted. Pour a thick glaze over the cake, then sprinkle with lavender buds to garnish. Ready for even more amazing November "Hot Chocolate" bundts? Check out my fellow #BundtBakers for even more clever twists on the classic drink.